VELMA MARIE PEIGNE STANFORD HOLT, After 101 years of a full life peacefully slept away in her home on Christmas Day, December 25, 2018. Born in Grayson, Oklahoma, Velma left there as a young bride with her first husband, the late Neil Stanford, and moved to Akron, Ohio. 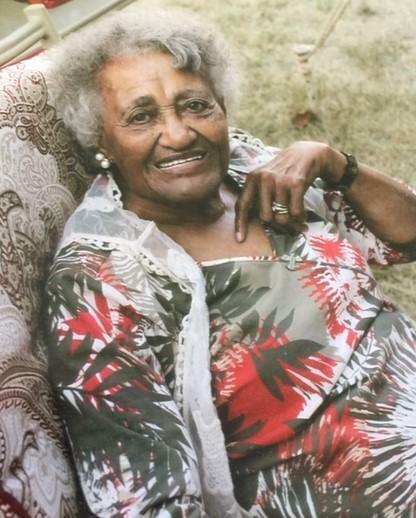 She eventually settled in Buffalo, NY during the early 1940’s, where she met and married the late George A. Holt, Sr; they enjoyed 48 years of marriage raising seven children. During World War II, Velma joined many women at the Curtiss Wright plant making materials to assist in that effort. While her children were attending school, Velma was a clerk in a local delicatessen close to her home. She ventured out as a community organizer with the Community Action Organization of Erie County and work for many years as a poll inspector with the Erie County Board of Elections. Her love of life was the 44 years spent as an outstanding cook in the kitchens of Buffalo’s inner-city Catholic church rectories. A recipient of many awards for her lifetime experiences, the most significant recognition is an Honorary Doctorate of Humane Letters presented by Christ the King Seminary in East Aurora. The conferring of this degree marked the first time the Seminary had given such a degree to a woman, to a non-cleric and to one without college training. Velma also received the St. Joseph’s Lay Award from the Buffalo Catholic Diocese and the Celebration of Sages honor from St. Phillips Episcopal Church. Velma’s love of life can be attributed to her religious faith; yet throughout her life she held a keen and devoted interest and love for music, especially jazz. Her late husband, George, was an acclaimed jazz trumpeter. Mr. Holt traveled the globe with his music and instilled in his wife and children a love of music that transcends the norm. Recall now, Velma was not only a cook, but also a gourmet cook. She and George entertained numerous friends and were well known for fine dining at their home on Sunday afternoons where beautiful music and inspiring conversations reigned. Velma leaves her children, Constance Stanford Coles, Lynn M. Holt, George A. Holt, Jr. (Mattie), Arthur R. Holt, and Dale A. Holt (Tina); sister-in-law, Nora Payne; two daughters-in-law, Shirley Stanford and Dawn Hooser Holt; seventy-five grandchildren, great and great-great grandchildren and many other close family and friends who loved her dearly. Preceding Velma in death are her sons, Cornelius Stanford and Marlon G. Holt, Sr.
Family will receive friends Saturday, January 26, 2019, 9am at St. Columba-Brigid Roman Catholic Church, 75 Hickory St. Mass of Christian Burial to immediately follow at 11am. Interment held at Forest Lawn Cemetery. In lieu of flowers, your gift in memory of Velma may be made to the Hospice Foundation of WNY, P. O. Box 590, Buffalo 14240-0590.